They call soccer the beautiful game. I call this a beautiful meal. 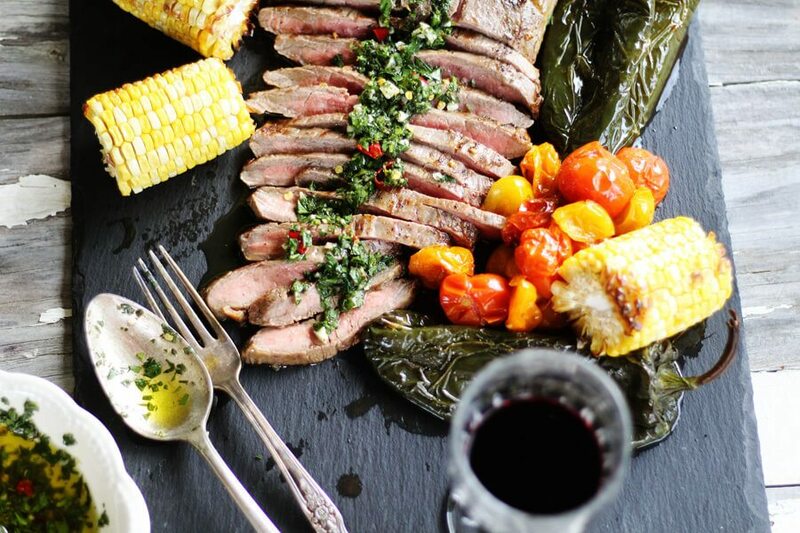 Paired with Trivento wines, this juicy and tender marinated flank steak is served with our homemade chimichurri sauce. 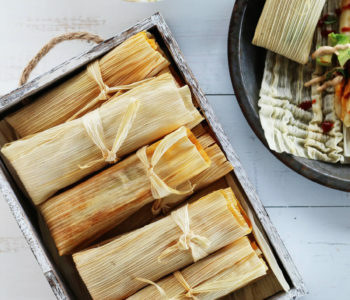 This cup-worthy recipe is perfect with roasted poblanos, heirloom tomatoes and sweet corn. 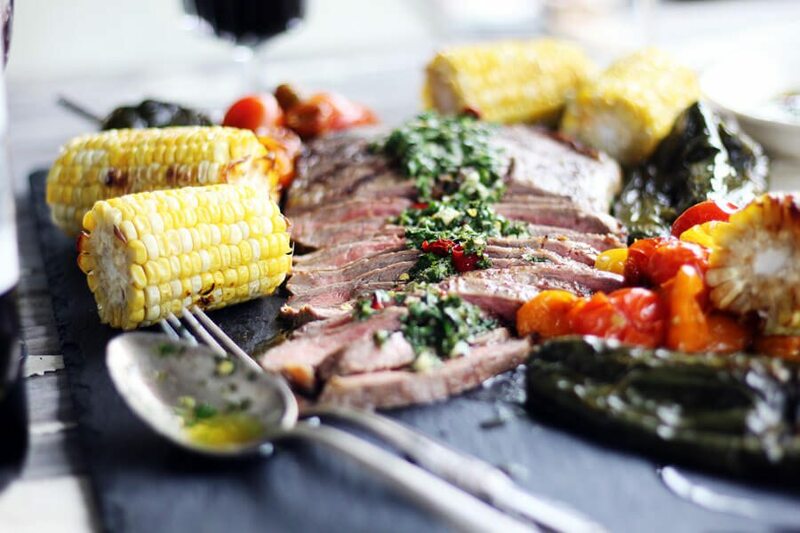 This recipe for marinated flank steak is 100% inspired by the food, wine and sport of Argentina. 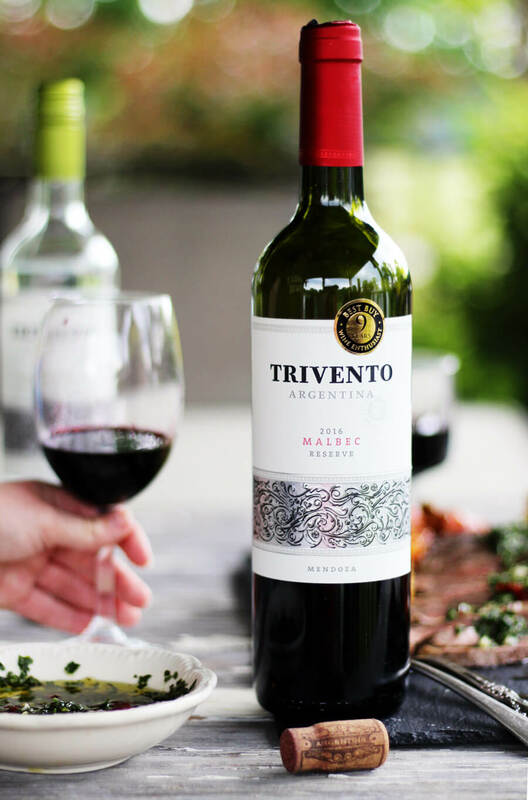 We are so honored to partner with Trivento Wines, the official wine of Major League Soccer, to bring you this wonderful recipe for all of your soccer watch parties. 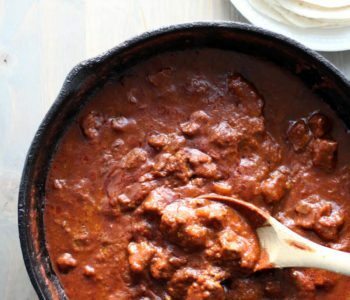 In this post we are going to give you four ways to make the most of this asado style meal and enjoy your game day. 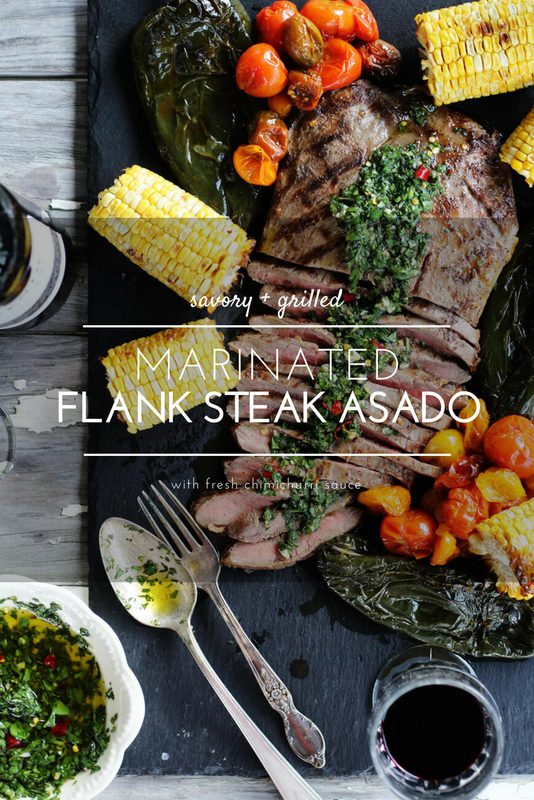 In South America, you most often will find flank steak prepared over an open fire or grill, asado style. Asado is essentially the Argentenian word for “barbecue”. Flank steak is a cut of beef from the lower chest or abdominal area of a cow. This cut of beef is long and flat and and can be tough. 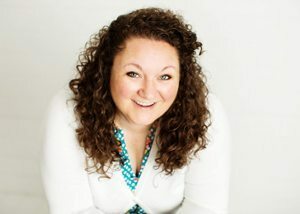 We are going to give you a step-by-step method to get tender and juicy results. Combine olive oil, apple cider vinegar, garlic, chilies and seasonings (complete ingredient list at the bottom of this post) in a shallow dish. Lay the trimmed flank steak flat in the marinade. (Be sure the excess fat has been trimmed from the outside). Turn the steak to coat both sides. There is no need to cover the meat with marinade. Cover and refrigerate overnight for the best results. Flip the flank steak every few hours to get all of that marinade into the meat. 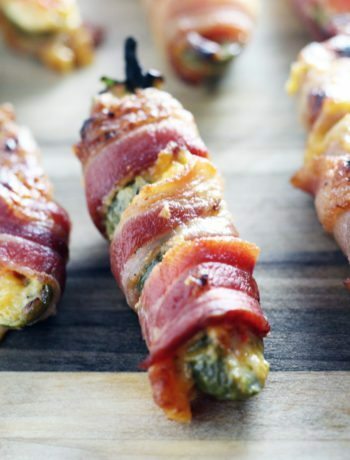 The simple combination of savory, sour and salty ingredients will be absorbed the meat. 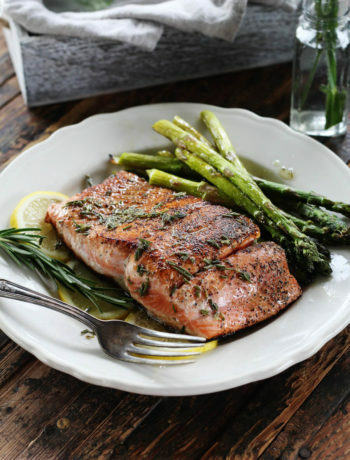 This will help break down the muscle and create an amazing meal. 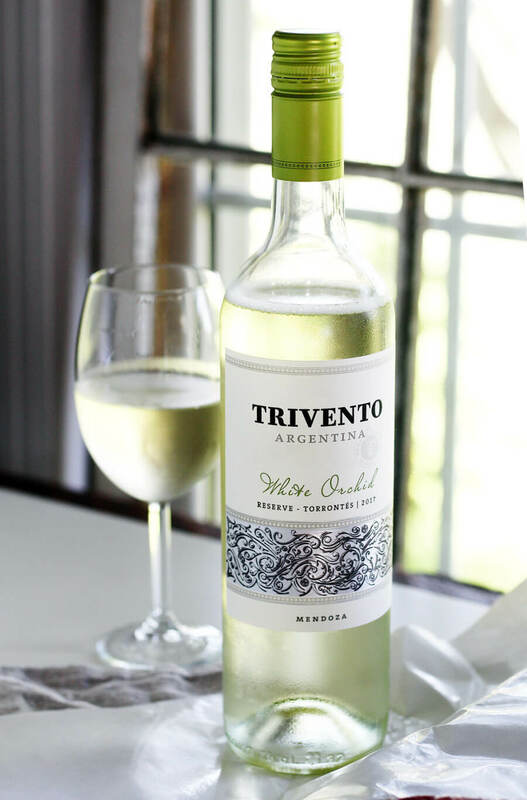 I highly recommend pairing this grilled + marinated flank stead with smooth, red Trivento Reserve from Mendoza, Argentina. Use the freshest herbs possible. Pick a great quality olive oil for the best flavor. 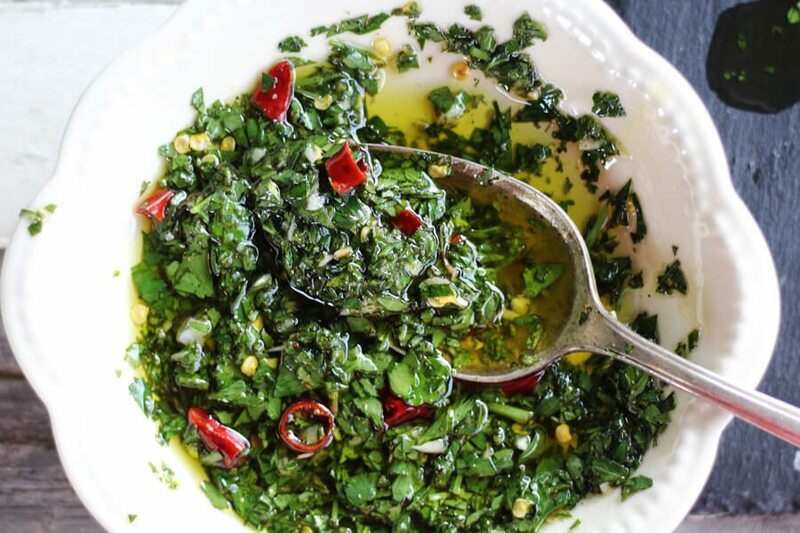 You aren’t cooking with this, you are eating it, so you want it to taste great and make your chimichurri ingredients shine. 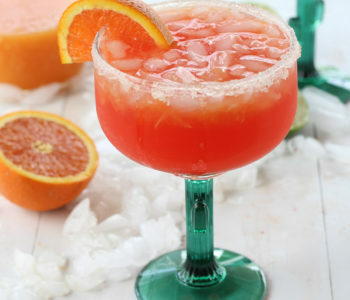 For acidity, use freshly squeezed lemon juice or an equal amount of red wine vinegar. Red chilies are totally optional. I like to use Fresno chilies because they are milder than a typical hot chili. Plus I love the pops of color. Control the heat level by leaving them out, or remove the seeds. Sea salt and fresh cracked black pepper are the best for this recipe. 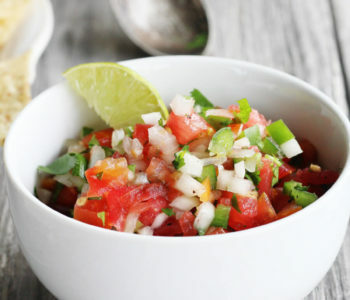 Try our recipe for Sheet Pan Salsa Chicken. 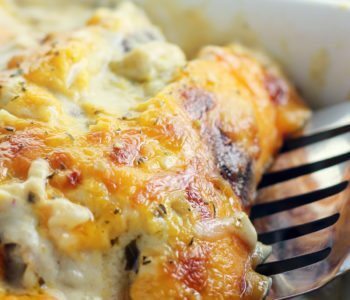 So yum and low-carb. Get the complete ingredient list at the bottom of this post. Simply stir everything together and let it sit at room temperature for at least 30 minutes. I like to make it before I start grilling to let all of the herbs and garlic flavors meld. Get your grill HOT. You want the flank steak to sear quickly to hold in all juices. I recommend a 450 – 500 degree grill if you have a thermometer. If you don’t have a way to measure the heat, get it hot enough so you can only hold your hand over it for a second. Shake the excess marinade off, but don’t wipe it off of the flank steak. Place the marinated flank stead directly on the hot grill. Sear for 3-4 minutes. Rotate 45 degrees and continue to cook for 3 minutes. Transfer to a plate and cover with foil. Let rest for 15 minutes. Thinly slice the grilled flank steak ACROSS the grain. The key is not to over cook the flank steak. This recipe is best served rare to medium rare. Cooking times will vary based on the thickness of meat, grill temperature, grill type and preferred doneness. Just remember: hot grill, sear quickly, cover, rest, slice across the grain. 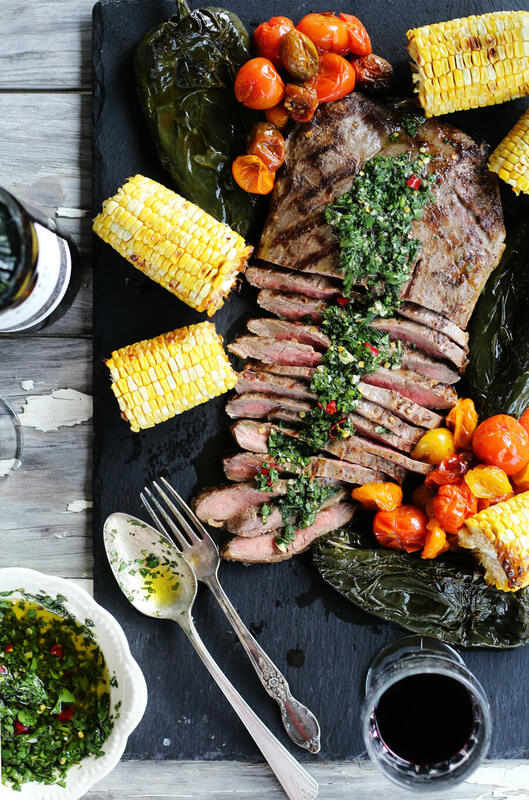 You can serve this Marinated Flank Steak Asado + Chimichurri with your favorite roasted vegetables. 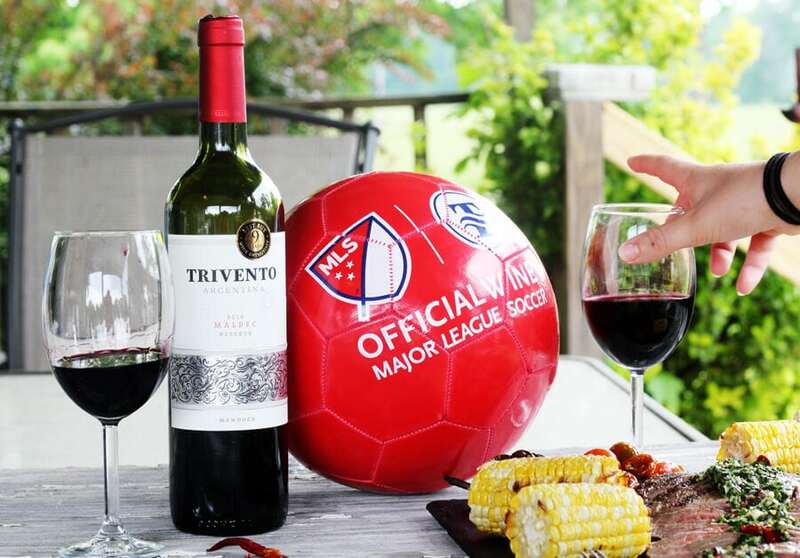 Of course, enjoy with the bold flavor of Trivento, the Official Wine of Major League Soccer. 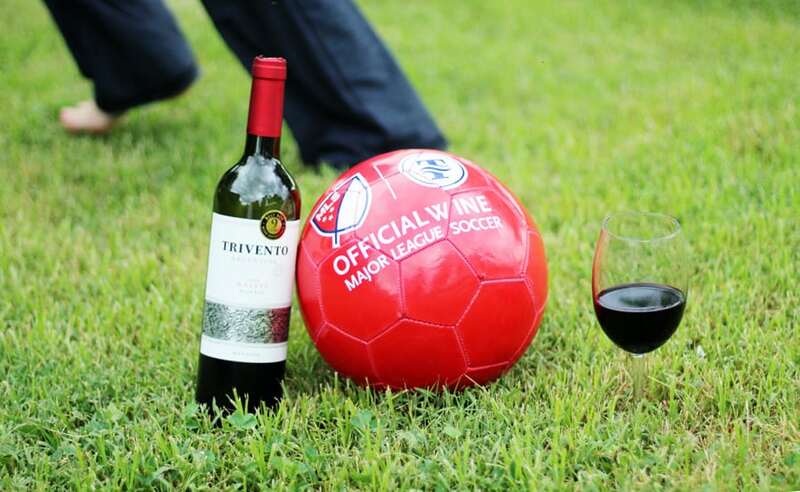 Click here to learn more about the Trivento-MLS Loyalty program. Score big! We would love to hear about your soccer game day traditions, favorite meals and get-togethers. Leave your favorite ideas in the comments below. For more MLS ideas and inspiration, follow Trivento on Facebook. How do you top a meal like this with family and friends, watching MLS? 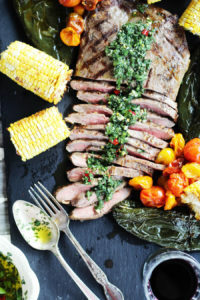 An easy recipe for marinated flank steak cooked on the grill and served with a homemade + herby chimichurri sauce that is out of this world good. In a shallow dish, combine all ingredients except the steak. 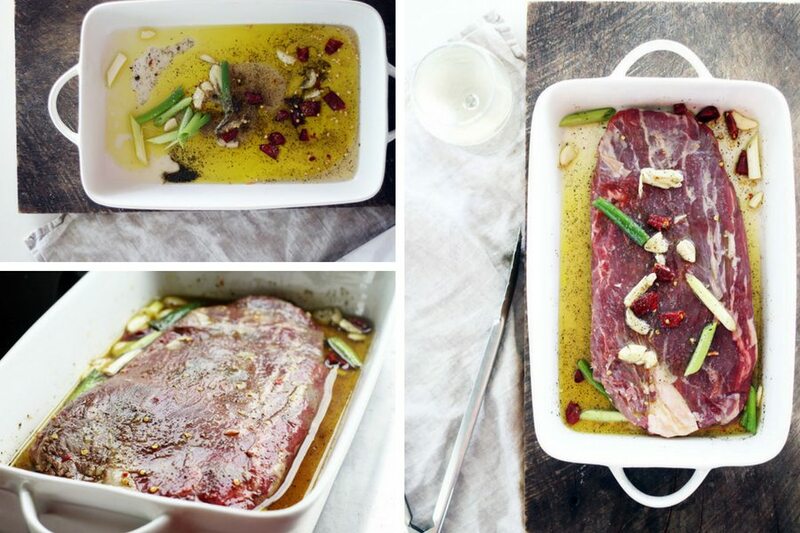 Place the flank steak in the marinated, turning to coat well on all sides. Cover and refrigerate overnight. Turn the steak every few hours. When the flank steak is ready to cook, heat a grill to very high heat, around 450 degrees. Shake the excess marinade from the steak and place the steak directly on the grill. Cook for 4 minutes, rotate 45 degrees, and cook for another 3 minutes. Flip and repeat, cooking for 4 minutes, rotating and another 3 minutes. 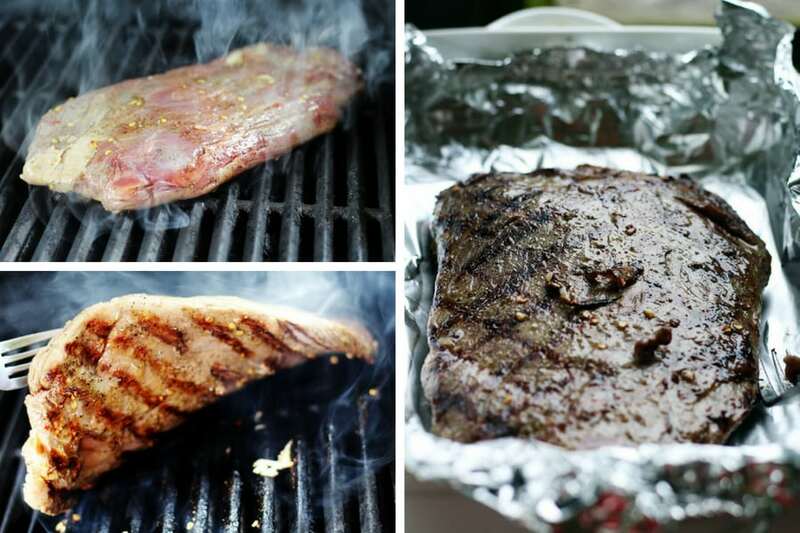 Remove the flank steak from the grill and cover with foil. Let rest for 15 minutes. Transfer the grilled marinated flank steak to a cutting board. Using a serrated knife, slice the flank steaks in thin strips across the grain. Serve warm with roasted vegetables and chimichurri sauce. Combine all ingredients well in a bowl or jar. Let rest at room temperature for at least 30 minutes. Serve with your favorite grilled meats and vegetables. Cooking times of your flank steak will vary based on thickness of steak, grill temperature, grill type and preferred doneness. 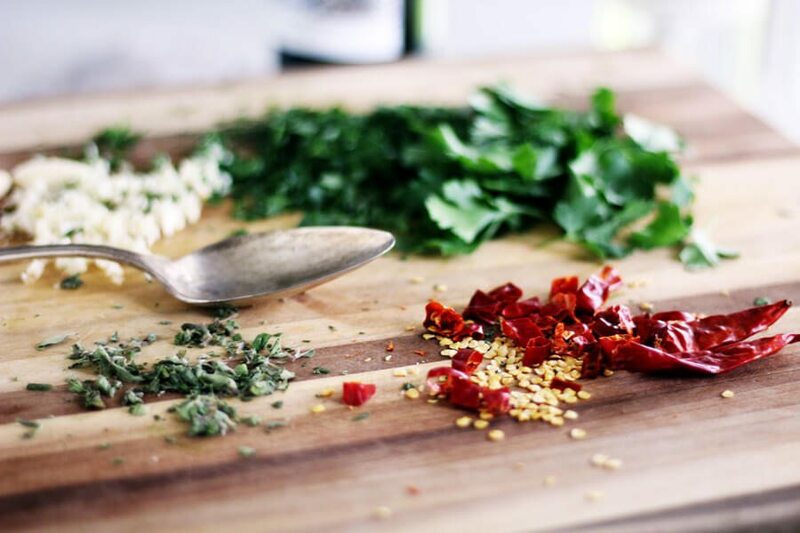 To control the heat level of your chimichurri sauce, you can leave out the chiles.